Oh it’s that time. That time of year where we’re mere hours away from the finale, meaning the anticipation grows stronger, and the conspiracy theories run wilder. I mean holy crap. Talk about ramping up the rumors and speculation to ludicrous speed. Geez people. Calm down. The funny thing is, it happens every season. And every season people get suckered in, and then they realize the show is overhyping something and it turns out to be nothing. Then the next season will roll around, and at the EXACT SAME TIME, people will start buying in again to the rumors and speculation, when in reality, the answer has been there for you all along. I haven’t wavered all season from what I reported back on Nov. 24th and I’m certainly not wavering today. Not because of pride or stubbornness because I’m hoping some sort of “guess” comes true. No. It’s because I know what happened. I’ve said that since they day I reported the spoiler. I don’t guess, I don’t predict, I don’t assume. I have numerous sources who confirmed to me back then that Chris got engaged to Whitney and that’s the ending you will see tonight. Period. End of story. You will see tonight. I’m not the least bit concerned about Chris’ ending. Obviously there’s a reason for that, it’s because of the texts, emails, and phone conversations I’ve had with sources that gave me the 100% proof I needed. Can I share that info? Of course not. That’s why all I can say over the last 3 ½ months anytime someone questions it, is “Chris is engaged to Whitney.” That’s it. That’s the ending of the show. But I can’t out my sources, so of course you might doubt. But if you’ve noticed (and you’ll see in tomorrow’s column all the doubting emails I’ve received the last 3 months), all the doubters can say is I’m wrong because of what they saw during the season. Maybe they like Becca more than Whitney, maybe they just want to see her win, maybe they just want to see me be wrong, but mind you, none of them once came to me with any hard evidence of Chris choosing Becca back on Nov. 22nd the day of the final rose ceremony. The show can edit and splice promos until they’re blue in the face. The one thing they can’t do though is change what happened back on the day of the final rose ceremony. That’s where my info comes from. Not anything that happened since. That stuff doesn’t matter. Completely irrelevant. I’ve had the hard evidence I need since that day. I just can’t share it. So I just repeat myself like a broken record all season saying “Chris is engaged to Whitney.” Because he is. By the way, tonight for 30 minutes before the finale starts, I have teamed with Skinnygirl cocktails to do a takeover of their Twitter account where I’ll be answering your questions regarding the “Bachelor” and “Bachelorette.” Very excited about this affiliation as I know many of you probably enjoy Skinnygirl margaritas while watching this show, along with many other of their drinks. We will be doing this more once the “Bachelorette” season rolls around, but will start tonight for the finale. So from 7:30-8:00pm EST, I will be answering your questions on @Skinnygirl Twitter account. Any questions, send them in. So where does that leave us? The best answer I can give right now is, “I don’t know.” All season you know I campaigned for Britt. I thought she was the perfect fit for the lead role and a girl that the guys would drool over. Then Kaitlyn overcame her first episode edit and became a favorite with the public. Early last week I heard that production really was having a tough time deciding who they wanted as the next lead and the rumor going around was they were gonna go with both Kaitlyn and Britt, and the guys would end up choosing who they wanted on the first night. They did this once before on Byron’s season. However, I heard on Thursday that rumor wasn’t true. Then Kaitlyn and Britt are each shooting intro videos this weekend, so honestly, I don’t know what they’ve decided. Here’s one way to look at it: If they really have been torn over these last two weeks on who to choose, it would make sense for them to have both girls there the first night and let the guys choose. We saw this before on the “Bachelor” season 6 with Byron and Jay. 25 girls met both of them, then they decided who they wanted as the “Bachelor.” They were given a yellow rose (for Jay) and a white rose (for Byron), and each girl would go up and place the rose of the “Bachelor” they wanted on a tray. Jay and Byron had their backs turned to the women and didn’t see which ones voted for them. Once one “Bachelor” got to 13 roses (the majority), he was declared the “Bachelor.” Byron got to 13 first and at the time, Jay only had been given 7 roses. So they only showed 20 of the 25 votes, and Byron already had 13. IF, and it’s still an “if,” but if they choose to go with two “Bachelorettes” and the guys choose, my guess would be the guys would choose Britt. I’ll tell you what, I’m kinda hoping this is what the show has decided to do. I’d be fine with it. Why? Hell, this is season 30. A nice round number. It would kinda make sense to do something different for the first night, no? Why not? It’s only been done once in the franchise history. And we know both girls were seen filming intro videos this past weekend in CA, not to mention Mike Fleiss made it a point again on Friday to tweet out that a decision has not been made. Now, here’s something to remember if they decide to go with two “Bachelorettes.” Back in 2004 when Byron’s season was filmed, social media wasn’t around. So yeah, when it premiered in September of that year, it probably wasn’t known who the girls chose. Obviously in 2015, I’m guessing if I don’t hear within a few days of who the guys chose, then it’s going to be spoiled the first time there’s a public date since we’ll see which girl it is. Not to mention, you can’t tell the girl who isn’t picked, “Don’t go on social media for the next two months and don’t be seen anywhere.” Trust me, it’ll get out. And sooner rather than later. Do I think that would detract them from doing this? Not necessarily. To me casting two “Bachelorettes” and having the guys choose will have less to do with wanting to keep it a secret, and more to do with changing things up on the first night. It would make the premiere episode completely different. If you remember Byron’s season, after he was chosen by the girls, THEN the cocktail party and first rose ceremony was the following night and he narrowed it from 25 down to 15. Of the 15 he kept, some had obviously left a rose for Jay wanting it to be him, so that made things a little more interesting. You’d have the same thing this season if they decided to do it. Whoever the “Bachelorette” was, she’d end up keeping around someone who initially didn’t choose her. Hell, Bryon’s final 2 girl that season was Tanya, and she voted for Jay. Of course, I’m completely getting ahead myself though because as we head into the finale, I don’t know what they’ve chosen to do. This two “Bachelorette” thing may all be for naught and they have decided on either Britt or Kaitlyn. But hey, it’s fun to think about. Thought it was Kaitlyn two weeks ago, and it still might be. But I do not know for sure. You’ve got people from both camps swearing it’s either one of them, then I’ve got the rumor that circulated last week that they were thinking of going with both. Maybe they will. Hell, I HOPE they do. I think it’ll be a nice jolt to put into the franchise where we can at least see something different on the first night. We’ll find out tonight on the “ATFR” when they make the official next “Bachelorette” announcement. All last week ABC has been running a promo in which they specifically say to stay tuned for the ATFR for a “surprise twist you didn’t see coming.” Trust me, a gazillion of you have asked me about it since it started airing. I’m guessing ABC wants you to think it has something to do with Chris’ decision, etc. It doesn’t. Again, Chris is engaged to Whitney. So I don’t know what they’re teasing and since we know this show is the king of hyperbole and overhyping something, my guess is whatever it is, it doesn’t have to do with Chris and decision. For all we know, it could just be Chris “officially” saying he’s on DWTS. Or since they’re specifically saying this twist is on the ATFR, the twist they could be referring to is the “Bachelorette” announcement. What better “twist” than to say they’ve chosen both Kaitlyn AND Britt, and the guys will decide on night one? It’s certainly possible. A lot to digest I know. But just know that the spoiler of Chris getting engaged to Whitney back on Nov. 22nd in that barn is 100% accurate. Can’t make that any more clear. As for “Bachelorette,” that’s where it gets a little tricky, and honestly, I’m fine with any outcome. If they chose Kaitlyn? Great. If they chose Britt? Even better. If they decide to go with both and the guys will pick on the first night? Would be interesting and different. None of those three scenarios would surprise me at this point, so just wanted to let you know all three of those are on the table as we speak. I don’t know what decision they’ve made. We’ll find out tonight. Should be interesting. If I somehow hear anything before it happens, I’ll tweet it out. But I don’t expect to this late. Man, can’t we just skip to the last 30 minutes of episode tonight and then the ATFR. The first 90 minutes of the finale is basically fluff since nothing that’s said even matters. Just a bunch of hot air and editing to get you to think he’s leaning one way, or maybe won’t propose at all, when in reality, it’s all just smoke and mirrors. Chris and Whintey sittin’ in a tree, k-i-s-s-i-n-g. I’ve waited 3 ½ months for this day to come. I’m much more excited about this “Bachelorette” announcement than the finale ending that I’ve known about since November. Should be a good one. Talk to you tomorrow. Maybe the twist is that they are going to have fans vote for who gets the next bachelorette. Keep them both the whole season. It would be a riot if they both wound up wanting the same guys. I think the guys would choose Britt because, although they are both beautiful, Britt is more of a “Barbie doll” and has the wow factor. But, I think that would prove to be a mistake because Kaitlyn would be a much ‘cooler’ (and easier) girlfriend/fiancé. I think that Britt would be very high maintenance and expect to be fawned over. Just my two cents! Did you Google “Kaitlyn Bristowe up angle bad lighting” for that lead picture, Steve? We know you want to get in Britt’s pants, but that was cold, man. I’m so glad to be reading that Steve isn’t sure it is Kaitlyn. I truly think Britt would be a much better show to watch. The guys who apply to be on the Bachelorette are not guys who would typically end up marrying a woman like Kaitlyn. Kaitlyn is fine, don’t get me wrong. I think, unfortunately, if she is the bachelorette it will turn out just like Andi’s season and she will “get” whoever she wants because who doesn’t want to “win” in this type of situation where the only woman available is one woman – however, my guess is that her relationship will end similar to how Andi’s relationship ended. Andi and Kaitlyn need different types of men than the men who would go on this show. I think Britt is perfect for this show! But if it’s Kaitlyn, PLEASE ABC do something with her hair. What is up with that picture, Steve? She looks balding! Poor thing! I really thought that Britt killed her chances with her WTA appearance. The girl just cried the whole time, no one believed her at all. And she basically admitted she’s still in love with Chris. So in terms of story, how are we supposed to believe she wants to turn around be Bachelorette already? I also just love Kaitlyn and think her hilarity is the freshness this show needs. You always say the contestants, not the lead, run the show and I think Britt is way too needy and dramatic and will just start to annoy everyone. I think fan voting would be the best scenario. I think Britt has a handful of really intense fans, but I think the majority of the population relates better to Kaitlyn. So yea, Britt has her insane fans tweeting producers etc, but in all the polls I have seen it has been a vast majority of votes go to Kaitlyn. Britt is very pretty, but her Hollywood story/sob fest on WTA did not portray her well for the leading role. I didn’t go back and read the article from after the WTA, but didn’t Steve say he was sure it’s going to be Kaitlyn for Bachelorette? I wonder what he based that on, if he’s now changing his story. Hmm, so interesting… I think the two Bachelorettes would be fun, just for the sheer shock value, but I am absolutely a Kaitlyn fan. Here’s what I don’t get: Britt makes me cringe. I’m a girl, so maybe it’s different, but she’s just SO over-the-top emotional and self-centered. I watch every Monday with a big group of friends, including guys, and all the guys prefer Kaitlyn’s personality (direct quote about Britt: “if that chick starts crying one more time I swear I’m turning off the TV”). They’re 50/50 split on who’s prettier, NOT that that’s what the Bachelorette choice should be made on… I also think it’s very telling that Kaitlyn had many friends in the house while Britt didn’t, and a better relationship with Chris, and the support of all previous Bach contestants/celebs (Anna Kendrick!). I’m keeping fingers crossed for Kaitlyn – just my two cents! I only watch the episodes weeks after they air as it is. If they choose Britt I won’t watch at all but I might puke a little. She’s pretty, even with too much make up but the lights are on, nobody’s home. Ugh at the thought of Britt still having a chance. I stand by what I said a few weeks ago in a comment. I’ll keep visiting this blog because I love your writeups, but I am not going to watch the show with Britt as the Bachelorette. It’s just not happening. Looking forward to finding out the official answer tonight… And if they do the “men pick on the first night” nonsense, I look forward to getting that spoiled for me ASAP. Thanks for the wonderful reviews and spoilers RS! You definitely make the show much more enjoyable! I could definitely see them going with some social media voting angle to try to up the first night ratings (tweets, likes, texts, etc). The only reason they would do anything different is for ratings, and this makes the most sense. I am pretty sure that those horny guys will end up preferring Kaitlyn what with her “you can plow my field any day” type of comments and because Britt is way too much drama and too emotional which is a turn off for any straight male. I just asked my husband who he’d choose if they had both on the show and he said after 2 minutes of talking to each it would be Kaitlyn no contest. He said initially he’d be more attracted to Britt but he’d be over it the minute she started being dramatic, emotional or he sensed she was acting. Hmmm, this could be interesting. I bet the big thing no one saw coming that they have been hyping will be 2 Bachelorettes the first night. Which would be fun to watch, but I bet the men will choose Britt. Ugh. Kaitlyn has a better personality, but the first night is superficial stuff. There isn’t enough time to really get to know someone’s personality. Tonight should be interesting! The twist on the ATFR will be that Chris and Whitney decided that they will reside in Chicago as their primary or secondary residence, since Whitney’s career as a fertility nurse is there, and because all of Chris’ sisters reside there. They’ll live in Arlington only during certain crucial parts of the farming season. Chris will probably be thrilled to have a reason to live somewhere else for part of the year, and with his money and money he’ll get from this show and DWTS, they’ll be able to afford a nice home in Chicago. So the other girls like Brit who were wondering about living in such a town where all the businesses have closed down will feel sad realizing that they could have had this type of arrangement too if they’d only given Chris the benefit of the doubt, that he’d take their wishes and needs into account. How’s that for a great prediction of the advertised surprise twist on AFTFR? The best and by far the COOLEST option would be to have TWO Bachelorettes for the ENTIRE season!! Imagine Kaitlyn and Britt both falling in love with the same guy, and them each offering him a rose. He has to decide which one he wants a rose from. It would be very different and much cooler than having the guys decide on the “first night” (as you suggest) which one out of the two girls they keep as the Bachelorette and which one they let go. Let it go through the whole season that way. Imagine a guy accepting a rose from Kaitlin, because of their connection, and the next week dating Britt and accepting the rose from her and NOT Kaitlin. What an amazing season it would be. Let them both be the Bachelorettes through the entire season — now that would be great entertainment!! Yeah, awesome idea, Steve. What fun to watch a young woman be rejected en masse, publicly. why not have 2 Bach’ettes all season long? Let the girls choose who they date, let the guys then choose who they prefer, sort from there, and have them all on at once. Start with 25 guys total, work it down to 10 guys per girl, and let the games begin. Agree – bad retouch on Kaitlyn’s photo! Like the idea of the guys deciding on night one. Social media deciding would be bogus. Represents a small fraction of the viewers and can be so easily manipulated. I like Kaitlyn better, as I think most women do. But Britt is better suited to the job. She would have no problem leading 25 guys on, but Kaitlyn probably would. Whether Britt is naturally duplicitous or naturally loves everybody – it all comes to the same thing on TV. With Britt – gorgeous looks, needing everyone to love her, her TV would be much better and we’d see a lot more men crying. Crying hard. Not so likely with Kaitlyn. Of course one of the girls would film a fake intro! Money talks! What’s the big deal? They filmed both women simply to validate their “we’re torn” farce of a decision. It’ll be Kaitlyn. It always has been. The audience definitely cheered more for Kaitlyn. And then to have to watch Britt stand there next to Kaitlyn flipping her hair thinking “I got this”. Nooooooooo! Let’s hope these men watched this season and have half a brain. I don’t think I can watch an entire season with the vapid fake actress. One more comment, it wasn’t just the audience, all of the former contestants are team Kaitlyn. At least most that I saw on twitter. They think the producers are screwing Kaitlyn. Please, oh please let Britt go down in flames. I really like Britt. She never spoke ill of the other women and carried herself with class. Kaitlyn is someone who gravitates to a younger demographic because she’s witty. I also think a lot of women who can not appreciate a beautiful woman like Britt feel threatened by her. If only one woman stays then I think the men will choose Britt. They will see Kaitlyn as “one of the guys”. I also can’t stand how Kaitlyn licks her teeth so much and moves her mouth and lips like she has food in her teeth. Just saw both women on Jimmy Kimmel and they don’t have a clue that one will be leaving on the first night. At the after party following WTA CH consoled Britt with a gentle hug, a tissue for her tears. The next morning over coffee Britt informed CH that she would be the next Bachelorette. Panicked, CH convinces the other producers to have two Bachelorettes. What happen with the pregnancy test shown on previews? I thought I watched every episode. Watching Britt’s continuous hair flipping (puke) and her drama is gonna be too much for most of us. I like a whitty, fun loving girl not someone who is totally fake and phoney. Always preferred Kaitlyn and she is very pretty. I never saw anything special about Britt and still don’t. As to Whitney…quite a performance there girl! Academy Award goes to Whitney! Can you imagine the highlight of their days…watching corn grow! That woman’s voice is enough to make me walk out on her. And poor simple minded lipless Chris! What a total tool. He is such a poor speaker. She will mow him down in every conversation as he sits there with that vapid look on his expressionless face! He could not keep me interested for more than a minutes. Maybe Whitney is just desperate. How many men would be attracted to her stringy, clumpy hair and once she opens her mouth and speaks…ugh! Poor girl needs a good meal also…just not lookin good with the stick like figure. Oh and Chris…please keep your shirt on in the future! No he man look with the pudgy tummy! Give him 5 years and that belly will be way over his belt line! Nice job calling it again, RS! Oh, how pissed Kaitlyn is. Ha. Yeah, Kaitlyn is not happy. Nothing makes a girl more less confident than having to go up against someone with model looks. But, it really could go either way. The biggest problem for Kaitlyn is she has one night …. maybe amounting to a couple of hours …. to convince 25 guys that she’s got the better personality & is the better bet longer term. Trying to get more than half the guys to get past Britt’s looks, and dreams of the Fantasy Suite, to see Kaitlyn is going to be tough. 1. It appeared from Britt’s plastered on smile and Kaitlyn’s sour puss face that neither girl was aware of the double Bachelorette twist until closer to the AFTR appearance. Although, both may have still signed on had they been told (moreso Britt than Kaitlyn), it really felt like the producers pulled one over on the both of them and made each think they were THE Bachelorette. Once contracts were signed there was nothing each could do to back out. Again, I don’t know that Kaitlyn would have signed up for it even with the cash/fame incentive. 2. The idea for the guys to choose rather than the viewing public was a strategic move on the producers part. Had they gone with a vote from the viewers, Kaitlyn would have won. The indicator was the response of applause each got when asked by CH who they wanted as Bachelorette. If the audience at the ATFR can’t hide their distaste then the viewing public would have definitely went with Kaitlyn. That just confirmed what the producers already suspected – Kaitlyn would have beaten Britt hands down. At least with the guys picking – Britt has a fighting chance. In fact, the odds are tipped in her favor. The producers have loved Britt from the beginning and they have made no secret of it. They probably thought this was a way to please everyone and it would certainly bring drama and even more viewers on the premiere airing. 3. I feel that when the premiere airs the producers will edit it so that it appears that the guys are split down the middle. If they go with the premise of one of the girls leaving night one. I have a feeling, though, they will make it drag out to further episodes to wring all the drama out of it they can. That is why the actual premise reveal has been vague. This gives them that option and they are not pigeonholed. In the end, I believe the producers will maneuver it to the point where finally Kaitlyn has had enough time with the guys (and Britt) that more of them will choose Kaitlyn. 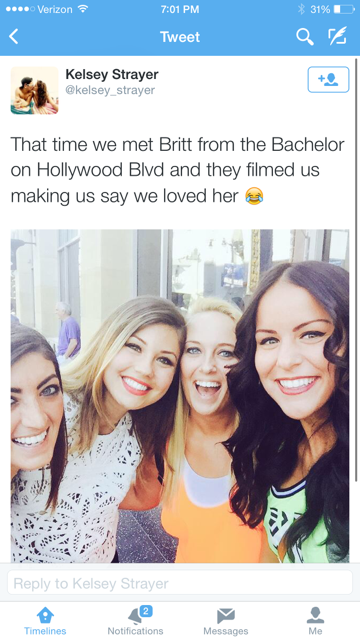 Britt will be exactly how she was on The Bachelor and probably worse. Her time there is only meant to last for so long and she is probably told that soon during night one or close after. Her only reason for going on was fame any way (and not love) so everyone got their way in the end. 4. Great job, RS on another great season reveal! Britt has amazing pheromones that make men go wild – the farmer made out with her in front of the other girls, she got RS hot and bothered to the point of losing his impartiality, and she got CH and the producers to make her the co-bachelorette against the vote of the female Bachelor Nation. Wow. GO BRITT!! It’s not just guys who like her. There are many women who appreciate a person who is kind and doesn’t badmouth others. When people express cynicism about someone else’s kind and gentle spirit it often says more about them than the people they’re criticizing. I’m amazed anyone here believes the audience reactions. We all know those people are egged on to clap and hoot and holler as it suits the production people. Reality Steve – I have been reading your for season after season, can’t even remember how long, but YOU are my favorite part of this whole franchise. I just love that you are always right! It gives me great joy to see your information play out as you describe all the way through the final roses! Keep doing what you do Steve! Betsy, Bachelor Nation ‘chose’ Juan Pablo and look how that turned out. Best to not leave such decisions up to Bachelor Nation! Oh, my, gosh (lol). I used to think you were a bit defensive of your spoilers, but reading the email you get I completely understand now why that is. It’s so scary to see how out of balance/reality some people are in these emails. And the weird anger, and honestly, insane meanness. I forever hope every season brings you vindication!!! !